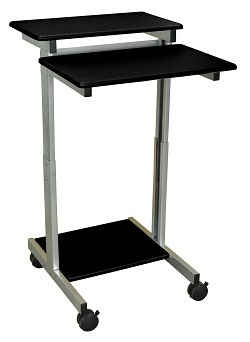 This compact and portable Sit to Stand Up computer cart is ideal for use as a walkup station to enter data or fill out forms. It’s the perfect companion for desktop, laptop or tablet computing. Mobile and adjustable to meet your everyday needs. Overall 24" wide x 28.8" deep x variable height 28.5" - 40.5"
Lower Shelf Height ranges between 28.5" - 40.5"
Upper Shelf Height is 24" wide x 14" deep, height ranges between 34.1" - 46.1"